The “Economic Freedom of the World 2010 Annual Report” released by Fraser Institute, a leading think tank of Canada, portrays a miserable picture of economic freedom in Nepal. Nepal with a score of 5.34 ranks 125th out of the 141 countries where the study was undertaken. Nepal continues to be one of the least economically free countries in the world and is among the very few countries whose degree of economic freedom has actually decreased in the last 30 years despite the fact that majority of the world in the same period was moving towards more economic freedom. The dismal portrayal shouldn’t come as a surprise to us as we are quite aware of the situation of our economy which is really at its knees. Our hopes of a prosperous future are bleaker than ever. Being in the after math of a decade long civil war combined with growing political instability and insecurity, increasing impunity and corruption, power crisis and government intervention continue to torment our economy. The pathetic state of our economy is related to the low degree of economic freedom in the country. Economic freedom which is described as the situation where the people of a country are free to trade with others, compete in the markets, buy what they want, earn a living in a job they choose, keep what they earn, own things privately and securely is considered the primary factor deciding whether a country gets prosperous or not. Higher degree of economic freedom has been found to result in higher level of economic growth, lower corruption, higher life expectancy, higher living standard and higher income of the poorest 10 percent. This year’s report also includes a study relating higher degree of economic freedom to lower unemployment and homicide rates. Though Nepalese enjoy a considerable amount of civil and political freedom, our economic freedom continues to be severely curtailed due to defunct policies. The situation is the outcome of the fact that though countless fights of freedom were fought in the past 60 years with new agendas every time, economic freedom was never an agenda of those movements and until and unless the fight for economic freedom is fought, our dreams of prosperity will remain as elusive as ever. Among the five major components of economic freedom , Nepal scores 6.20 out of 10 in size of the government, 3.51 in legal structures and property rights, 6.36 in the access to sound money, 5 in freedom to trade internationally and 6.16 in regulation of credit, labor and business. Size of the government refers to the portion of the economy that’s covered by government spending. When government role in the economy increases relative to the role of individuals, households and businesses, government decision-making is substituted for personal choice and the economic freedom is curtailed. Nepal could improve its score by privatizing or shutting down the state run enterprises like Janakpur Cigarette Industry, Dairy Development Corporation, Nepal Airlines, Nepal Oil Corporation which are doing more harm than good. As private sector is fully capable of handling these sectors, there is no sense in continuing these enterprises incurring ever increasing losses every year. The government should also work towards decreasing tax rates as high tax rates prevent people from keeping what they earn. Legal structures and property rights, is the sector Nepal has been performing worst in. Nepal could improve its situation by making court procedures faster and more efficient, removing political influence during appointment of judges and setting up separate commercial courts for business related cases. Scrapping anti-property rights laws like land ceiling laws, eminent domain without compensation that promoted insecurity among people and discourages them to own properties legally should also be scrapped. State shouldn’t continue to tolerate criminal activities like extortion, theft and kidnappings. Controlling inflation is a primary factor in increasing access to sound money. The government should also adhere to fiscal discipline by controlling the high rates of monetary growth which stands at 9.32 percent currently. Nepal still remains among the few countries whose citizens can’t own foreign currencies. Freeing the central bank from political influence can be a major step towards promoting fiscal discipline. Nepal’s average tariff rate for international trade stands at a whooping 12.7 percent which has to be reduced to promote free trade. As free trade is now universally considered to promote economic growth and raise living standards of people across the globe, there is no reason on why Nepal should keep following protectionist policies and impoverishing the populace. Another factor that’s severely curtailing Nepal’s economic freedom is the policies that are hostile to foreign investment. Nepal’s score in allowing foreign investment is 3.87 out of 10 which is very unfortunate when our neighboring countries are clamoring for more foreign investment. Foreign ownership and investment should be allowed and encouraged as it promotes technological innovation and capital accumulation which are critical for economic growth. According to World Bank’s “Doing Business Report”, an entrepreneur in Nepal, on an average, should go through 7 steps, spend 31 days and 53.6 percent of per capita income to start a business which is incredibly costly as in economically free countries the same job can be done within a couple of days with lesser cost. There are even examples of countries like Rwanda which in an effort to create business friendly environment have brought down the time needed to register a business to a single day. Besides these, Nepal could reduce the hiring and minimum wage regulations. Nepal remains among the few countries where firing an employee is next to impossible. Such trends drive up the cost of doing business and make enterprises inefficient. Reducing the regulations for hiring and firing the employees can help to make Nepalese enterprises more efficient. These small steps could embark Nepal on the path of economic freedom along which various countries like Hong Kong, Singapore, Estonia, Botswana, New Zealand, and India have travelled to achieve prosperity. At a time as this when every Nepalese is wondering if a miracle is the only thing that could save us now, economic freedom could be the answer to our prayers. 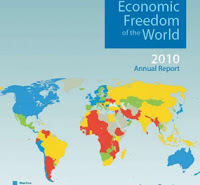 Economic Freedom of the World 2010 Annual Report can be a reality check for us and the small steps mentioned here in the article can gradually lead Nepal into being an economically free nation.